'It's the most I've enjoyed watching Ajay Devgn in a while,' says Sukanya Verma. When Ajay Devgn promises to wring out 'poora' Rs 420 crore from a sordid politician, there will be fireworks. But to my surprise, Devgn doesn't clobber a single soul in Raid -- not when his wife is hurt, not when his job is in jeopardy, not when a mad mob is thirsty for his blood. There is plenty of Singham-like bait thrown at him, but Devgn simply refuses to take it. On one particularly challenging occasion, he bolts the door and blocks it using bulky trunks and cartons choosing common sense over confrontation. As someone who has grown tired of the actor's relentless wham-bam, it is refreshing to see his toughness stem out of his beliefs and not brawn. His portrayal of Income Tax Commissioner Amay Patnaik in Rajkumar Gupta's fourth film as director (Aamir, No One Killed Jessica, Ghanchakkar) relies on his firm footing as a man of consequence to pitch itself as a tribute to the IT department's unsung heroes. On first glance, the character is deceptively similar to the khaki-clad, transfer-prone hotshots he has essayed before, what with the moustache, the deadpan eyes, the serious demeanour, the right-wingness. Except in the absence of cynicism, virtue sheds a new light. 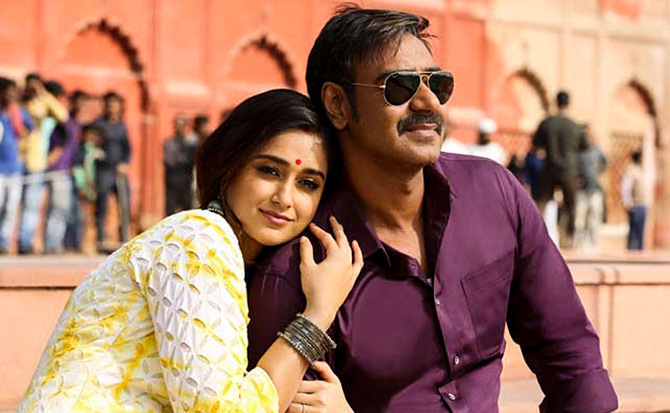 Based on a script by Ritesh Shah, Raid is buoyed by a classic right versus wrong theme. Although it is set in 1981's Lucknow, the schadenfreude of every honest taxpayer in watching tax defaulters, evaders and hoarders go down is timeless and universal. Gupta mines it frantically to stage an elaborate game of hide-and-seek across the meticulously conducted raid, which constitutes bulk of its 128-minutes running time. The antagonist, a sooty-eyed, contemptuous MP called Tauji played with contained peevishness by Saurabh Shukla, is a character that never gets to step outside its bubble of conceit. As the raid spans various stages of disbelief, resistance, pride, deceit, revelation, distress, in fighting, violence, more than Tauji it is his extended family that inject novelty into an unsurprising faceoff and monotonous mission. Raids are messy and lead to eye-popping disclosures, but the thrill of seeing heaps and heaps of money and gold wears off after a while, more like watching Aladdin's lamp breakthrough in a loop. Gupta goes overboard confiscating the unaccounted wealth, but the disarming spontaneity of the 'Amma' (a noteworthy Pushpa Joshi) character, as Shukla's wacky, unthinkingly yapping octogenarian mother is a neat touch. As is the presence of a mysterious mole causing believable scenes of internal conflict within the household -- Raid takes a clear moral stand yet views its greedy offenders as hopeless and human. Part of its tongue-in-cheek approach nudges at then-in-power prime minister Indira Gandhi. She seems more of a school principal really, continuously fidgeting her pen and mindlessly ticking off pages of a file. Raid refuses to engage beyond her side profile. Amidst the hilarity of this imagery, Gupta is blunt enough to suggest her tolerance for corruption in lure of political clout but spares her conscience to do the right thing. Despite its glowing sense of purpose and imaginative manipulations, Raid is staggeringly inconsistent. Other than the tired tropes of a corrupt colleague redeeming himself, hooligans attacking the wife to intimidate the hero and a phony period setting whose detailing is limited to trunk call woes and retro time pieces, it is the sloppy editing, tame camerawork and ghastly background score that hurt Raid the most. Ileana D'Cruz as Devgn's wife bears the brunt of these inadequacies. Her supportive, sari-clad significant other is clumsily forced into the narrative to underscore Devgn's blissful personal life. In one scene, she shows up with a lunch dabba in the middle of an official operation. That is relatively less absurd than what ensues when Raid digresses for a romantic song interlude. Did someone doze off on the editing table? The background music sounds as though it took its cues from Inception and ruins many a scenes with its misplaced ardour confusing persistence for panic. The informer subplot is curiously introduced, but offers little by the way of payoff. Gupta's love for realism also takes an inexplicable beating when Devgn permits Shukla to scoot off just to jam in some out-dated sher/kutta sledging. As disappointing that is, Raid does have its moments of compelling optimism and unexpected wit. It's also the most I've enjoyed watching Ajay Devgn in a while.